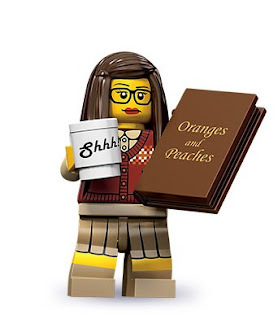 It's Sue here and I quite like the new Lego librarian MiniFig. Yes, she's got a stupid 'Shshhh' mug, but she's also wearing a cool tank top, her hair is down - not in a bun - she's sporting super nerd glasses and hot red lipstick. I'd be her friend - she looks like a pretty cool woman. Let's not waste too much energy getting sanctimonious and hot under the collar about stereotypes - at least we have an image that people recognise! Let's just go with it, reclaim, subvert and have fun.